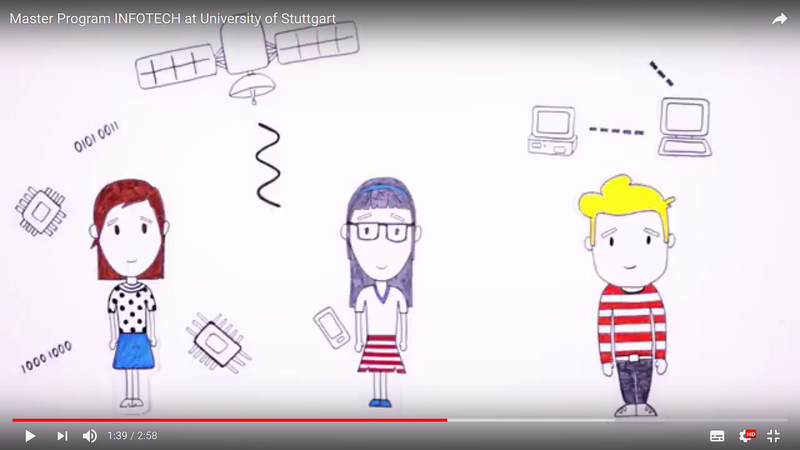 Interested in studying in Stuttgart? Find information on our high-level international degree-programs in Computer Science, Electrical Engineering and Information Technology, visiting non-degree options, our support structures and career opportunities. Interested in studying abroad? Find information on our exchange programs all over the world. This service is for students enrolled in one of the programs faculty 5 offers and for prospective students interested in one of our (international) programs. We are here to answer specific questions on our study programs and exchange programs in Computer Science, Computational Linguistics, Electrical Engineering and Information Technology. International Scholars looking for support are asked to refer to the "Welcome Center for International Scholars". Students interested in other programs than those faculty 5 offers are asked to refer to the "International Office" of the university. General questions about admissions are answered by the Admissions Office. Our service point wants to provide you with all the information you need: From how to apply to one of our programs and how to enroll up to everything relevant during your studies. Furthermore, we collect information for and offer advice to our home students whishing to study abroad. For specific information on the international Masters' programs please consult the programs' individual websites. Browse our new website for international students and students whishing to study abroad. Faculty 5 is home to four high-level international Masters’ programs: M.Sc. Computer Science and M.Sc. Computational Linguistics in the Computer Science department, M.Sc. Electrical Engineering in the department of Electrical Engineering and M.Sc. Information Technology (INFOTECH), which is taught by lecturers from both Computer Science and Electrical Engineering. All four programs are taught in English and are designed to attract students from all over the world who have a very good Bachelor degree. These motivated students will be taught by highly qualified lecturers: The "Times Higher Education" subject-ranking of 2017 ranks us among the 100 best in the world: Computer Science ranks no. 6 in Germany and no. 62 worldwide, Engineering ranks no. 5 in Germany and no. 88 worldwide. Furthermore, we also welcome international degree-seeking students in our other Bachelors’ and Masters’ programs. However, in order to study in these programs you need to be able to understand and speak German. All our Masters' programs prepare you for a PhD program or an industry job. The Stuttgart region offers excellent career prospects, as it is home to both global players (especially from the automobile industry) and smaller highly specialized companies. Several lecture series, job fairs and in some Masters' programs the possibility of working on your research project in the industry allow you to make contact with potential employers. The possibility of learing German in addition to your studies enhances your job chances. For more information on the programs and on application requirements please consult the program websites. For general information on the services we offer for international students please consult the sub-page "Studying in Stuttgart". Studying abroad is a very rewarding experience. Living and learning in a foreign country allows you to gain a new perspectives on your studies, your subject and often even your life. If you can find your way around in an unfamiliar environment and in a foreign language, there will be few situations that still scare you. You get to know new people, and you might be able to complement your course of studies with content not offered at your home university. Last but not least experience in a foreign country is likely to be well received when looking for employment and starting a career. Faculty 5 offers different possibilities for studying abroad, ranging from exchange programs to summer schools. Check out the website for outgoing students to find a program suitable for you or to contact an advisor. Faculty 5 (Computer Science, Electrical Engineering and Information Technology) is proud of its international student body and the high number of international PhD-students: Approximately 25% of our students come from abroad, many of them from China, Turkey, India and Iran. More than 20% of our PhD-students and 10% of our academic staff come from different countries, too. We are regular hosts to Humboldt Scholars. Faculty 5 is interested in enhancing its international cooperation in research and teaching with renowned universities from around the world. We are particularly interested in universities with a similar research profile to ours and emphasize that high research standards are very important to us. Find all team members of our International Service Point and whom to contact with which questions.